The Lodge is Kent’s finest and most authentic master barbers using bespoke crafts and techniques for the modern gentleman. Our grooming rooms are the perfect destination for sharp haircuts, smooth hot towel shaves and other treatments. No appointment required and open 7 days a week. Why not visit our new & exclusive concept branch Residence featuring a bar, barista coffee and live music. "Visit us for an invigorating experience and one of the best shaves in town." Our featured branches are open the same business hours, 7 days of the week. Combine your choice of haircut with a traditional cut throat shave followed by hot towel treatment and finishing. A full head wash, followed by rinse, sharp haircut and blow dry for when you need to look and feel your best. A stylish haircut and blow dry including a refreshing hot towel finish. Trust The Lodge to make you feel like a new man, ready to face whatever is ahead, knowing you look the part. Expert beard trim and design by our master barbers including moisturising skin care and a hot towel finish. A traditional cut-throat shave and invigorating hot towel, hair styled, neck fluff removed, eyebrows trimmed and ears flamed. A stylish haircut and style for the young gentleman. Trust The Lodge to take the finest care and consideration. All Services Include Complimentary Beer & Other Refreshments. The perfect gift for the modern day gentlemen. The Lodge gift vouchers are available now via our online shop or in-store. The Lodge has worked hard over the last few years to bring you premium hair care and male grooming treatments that will make you look and feel like a million bucks. The hair care available, including shampoo and conditioner, is perfect for cleansing, toning and revitalising your hair. Also featuring a professional collection of hair styling waxes, fibres and pomades, our range gives you control over your hair style, so you can keep up with new hair trends from the comfort of your home. At The Lodge we stock the full SELECTION range in store for more information ask in branch or contact us directly. 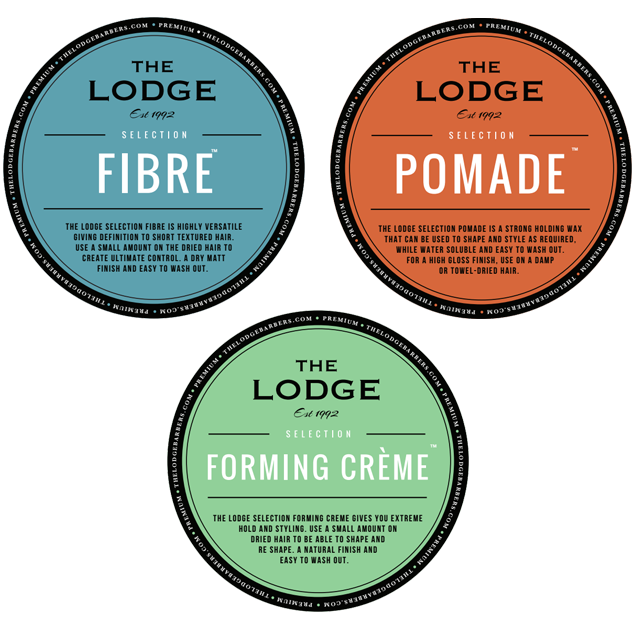 The Lodge Selection, the finest grooming products available in store.